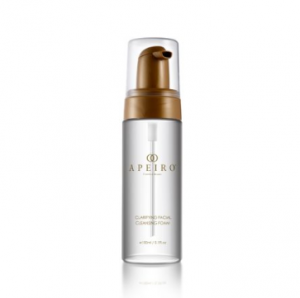 Exclusive beauty brand Apeiro introduces a pair of revolutionary, all-new cleansing products. NEW YORK , NEW YORK, UNITED STATES, March 8, 2019 /EINPresswire.com/ -- Renowned ultra-luxury beauty brand Apeiro3 is well known and respected among skincare aficionados for its certified cruelty-free, clinically tested, and fully FDA approved skincare product collections. Now, two all-new, wholly exclusive cleansing solutions join the boutique skincare brand's existing line-up of collagen renewal treatments, eye creams and serums, and revolutionary anti-aging products, among many others. "The first of our new products is a clarifying foam," reveals Eric Inbar, vice president of operations at Apeiro, "which features a wonderfully light texture formulated to delicately but effectively lift and remove makeup, pollutants, excess oils, and more." Touted as an 'ultra-gentle' foaming facial cleanser, Apeiro's Clarifying Facial Cleansing Foam1 is suitable for all skin types and promises to leave skin feeling 'supple, cleansed, and hydrated,' according to the brand. "Second," Inbar continues, "we have Apeiro's all-new Exfoliating & Cleansing Facial Gel2 which contains natural fruit grains to wash away makeup and impurities, geared toward soothing, hydrating, and refreshing the appearance of the skin." This, he says, leaves skin feeling not just incredibly clean and beautifully soft, but also younger-looking, too. Furthermore, the Apeiro vice president of operations explains that, while available separately, the brand's Clarifying Facial Cleansing Foam and Exfoliating & Cleansing Facial Gel work best in combination with one another. "Together, they're the perfect pairing of cleansing, hydrating, soothing, and refreshing skincare solutions," adds Inbar. Ideally applied to clean skin, both products, says the brand, should be massaged gently in circular motions into the face, paying particular attention to the areas surrounding the eyes. Just released, the two new lines combine to form part of Apeiro's more extensive, ultra-exclusive collection of cleansers. "Our collection of cleansers," Inbar points out, "includes established and much-loved products such as our Advanced Hydrafresh Toner, designed to gently remove any trace of debris, and our Advanced Milky Cleanser, formulated to rid the skin of harmful toxins and other impurities." Consumer and professional feedback for the entire range of Apeiro products is universally glowing. "Apeiro products apply beautifully," says one beauty industry reviewer, "and are rich to the touch, absorbing evenly into the skin leaving nothing behind but a complexion which glows and feels reminiscent of a firm, fresh rose." "We're on a mission," suggests Inbar, "to deliver results which are as dramatic as possible using only natural, organic ingredients, and posing an effective alternative to invasive cosmetic injections and surgeries." "Your skin deserves Apeiro," he adds, wrapping up, "and you do, too." To find out more about Apeiro's Clarifying Facial Cleansing Foam and Exfoliating & Cleansing Facial Gel, please visit https://www.apeirotreatments.com/shop/.